Beauty and the Beast is a musical with music by Alan Menken, lyrics by Howard Ashman and Tim Rice, and a book by Linda Woolverton produced by Disney Theatrical Productions. Based on the 1991 film of the same name, which was in turn adapted from the French fairy tale by Jeanne-Marie Leprince de Beaumont, Beauty and the Beast tells the story of a prince who is transformed into a hideous beast as punishment for his cruel and selfish ways, and an adventurous young woman named Belle whom he imprisons in his castle. In order to become human again, the Beast must earn Belle's love before it's too late. Seven new songs were written for the stage musical. Beauty ran on Broadway for 5,461 performances between 1994 and 2007, becoming Broadway's ninth longest-running production in history. The musical has grossed more than $1.4 billion worldwide and played in thirteen countries and 115 cities. It has also become a popular choice for high school productions. Features piano/vocal/guitar arrangements of 21 songs by Alan Menken, Howard Ashman and Tim Rice from this Disney Broadway smash: Be Our Guest - Beauty and the Beast - Belle - Gaston - Home - How Long Must This Go On? - Human Again - If I Can't Love Her - Maison des Lunes - Me - The Mob Song - No Matter What - Something There - Transformation/Beauty and the Beast (Reprise). Matching folio to Disney's award-winning film, by the same team that created The Little Mermaid music. Complete with 11 pages of beautiful full-color scenes from the movie. 8 songs, including: Beauty and the Beast - Something There - Be Our Guest - Belle - and more. 80 pages. Enjoy the timeless story of Belle and her Prince in this exquisite medley featuring the music from Disney's magical animated feature film. 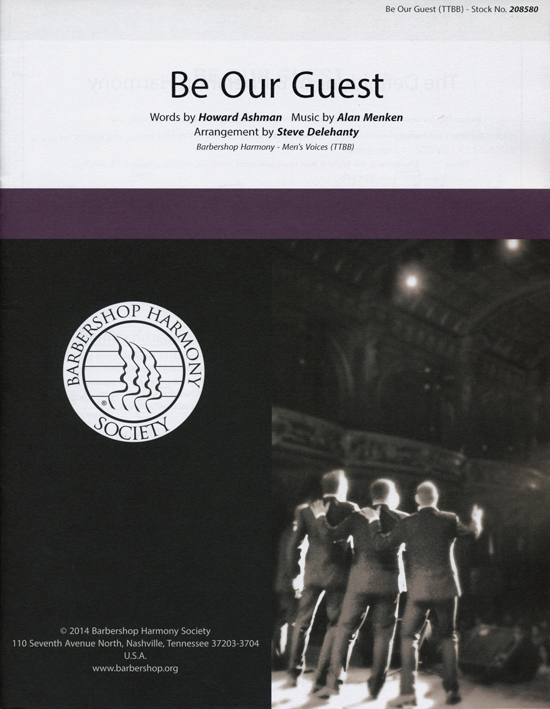 Songs include: Be Our Guest, Belle, Something There, Gaston, The Mob Song, Beauty and the Beast. 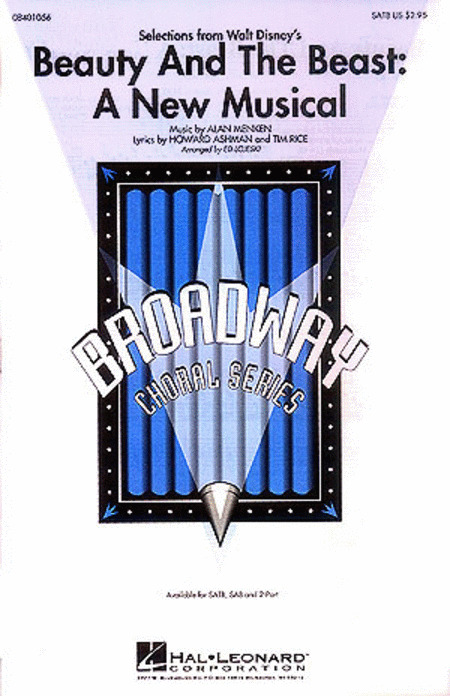 Available: SATB, SAB, 2-Part, Instrumental Pak, ShowTrax CD. Performance Time: Approx. 9:00. Sing along with a full orchestra! Alan Menken & Howard Ashman's title track originally penned for the Disney animated movie in the 1990s has now been updated in a new setting performed by Ariana Grande and John Legend for the 2017 live action film, presented in print as a vocal solo arrangement with piano accompaniment. It also includes access to an online fully orchestrated accompaniment for download or streaming so you can sing along and sound like a pro! The audio is accessed online using the unique code inside each book and can be streamed or downloaded. The audio files include PLAYBACK+, a multi-functional audio player that allows you to slow down audio without changing pitch, set loop points, change keys, and pan left or right. With 2 new songs incorporated from the Disney live-action animated movie, your students can be reaquainted with this beautiful Disney score. Songs include: Belle, How Does a Moment Last Forever, Be Our Guest, Evermore and Beauty and the Beast.